The Global Volcanism Program has no activity reports for Ostry. The Global Volcanism Program has no Weekly Reports available for Ostry. The Global Volcanism Program has no Bulletin Reports available for Ostry. There is no Deformation History data available for Ostry. There is no Emissions History data available for Ostry. 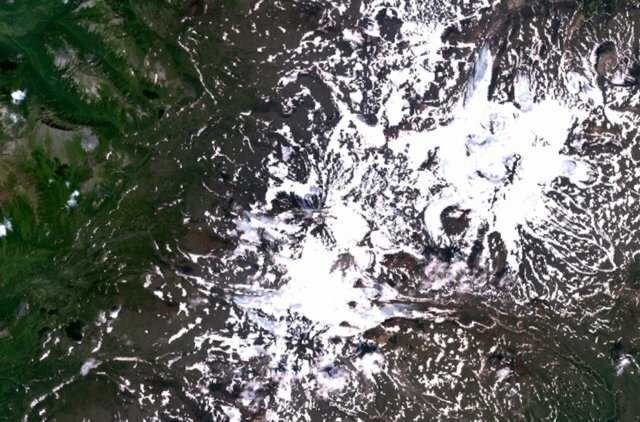 The peak at the center of this NASA Landsat image (with north to the top) is Ostry. 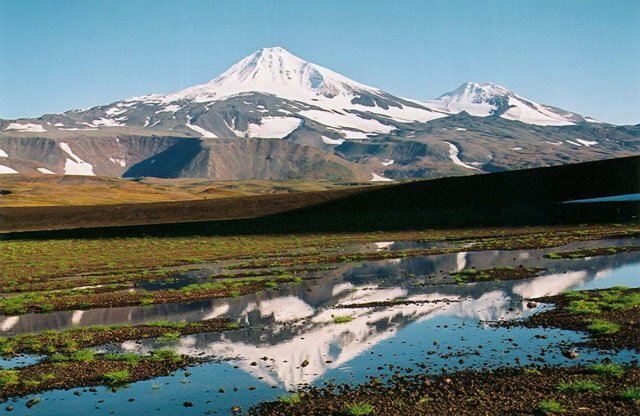 This late-Quaternary stratovolcano, whose name means "Sharp Peak," rises to 2552 m, forming one of the highest peaks of the northern Sredinny Range. Ostry lies WSW of the broad glacier-covered Snegovoy volcano (upper right). 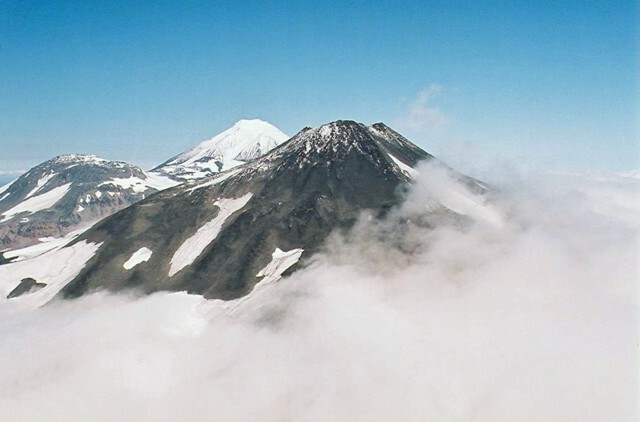 The smaller Kutina stratovolcano (bottom-center) is located immediately to the south of Ostry. An unnamed 2127-m-high cinder cone on the SW flank of Ostry is seen here from the west. The cone, informally referred to as "Cone X," erupted about 4000 years ago, producing a basaltic lava flow. 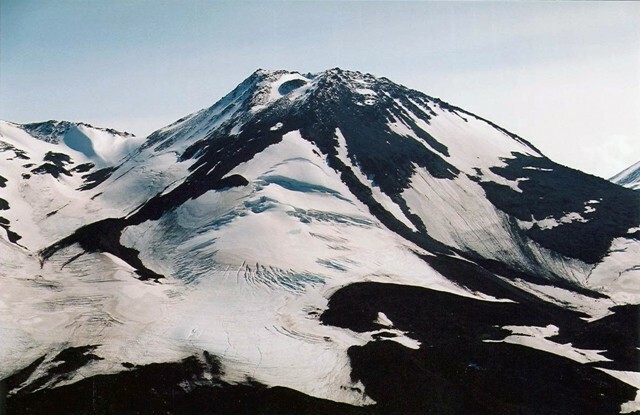 Snow-capped, conical Ostry volcano, seen here from the NW, rises to 2552 m. Ostry, whose name means "Sharp Peak," forms one of the highest peaks of the northern Sredinny Range. On the right horizon is an unnamed 2127-m-high cone on the SW flank of Ostry, informally referred to as "Cone X," which erupted about 4000 years ago, producing a basaltic lava flow. There are no samples for Ostry in the Smithsonian's NMNH Department of Mineral Sciences Rock and Ore collection. Large Eruptions of Ostry Information about large Quaternary eruptions (VEI >= 4) is cataloged in the Large Magnitude Explosive Volcanic Eruptions (LaMEVE) database of the Volcano Global Risk Identification and Analysis Project (VOGRIPA).